Product prices and availability are accurate as of 2019-04-25 01:51:18 EDT and are subject to change. Any price and availability information displayed on http://www.amazon.com/ at the time of purchase will apply to the purchase of this product. QUARTET Cast Metal Puzzle from Hanayama Puzzles of Japan is a delightful and tricky brain teaser puzzle. 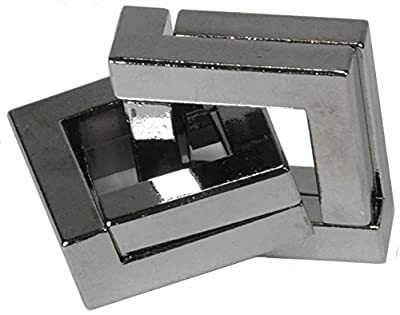 It consists of two interlocked square-shaped polished metal puzzle pieces that come apart into four pieces. The object is to separate the interlock into four square shaped pieces. 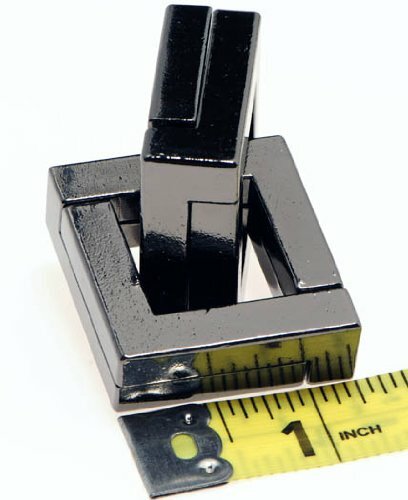 This is a very tricky puzzle and one of the most challenging in the Hanayama puzzle collection. You may find yourself totally intrigued as to how the interlocked was designed. Very fascinating disentanglement brainteaser ! Each square measures approximately 1.2 inches. Rated by the manufacturer as a level 6 difficulty (on a scale of 1 to 6 where 6 is the most challenging.) Level is posted on the bottom left of the packaging. Your own experience could vary substantially. QUARTET is part of a series of 55 plus very interesting and mentally provocative metal brain teasers from the Hanayama Puzzle Company. Some serious puzzlers refer to these as "disentanglement-style puzzles" as they involve taking something apart and then re-assembling. Re-assembly can also be a puzzle and may be equally as tricky.